Mininet is free software that creates a realistic virtual network, running real kernel, switch and application code, on a single machine (VM, cloud or native), in seconds. Mininet is useful for development, teaching, and research. Mininet is also a great way to develop, share, and experiment with OpenFlow and Software-Defined Networking systems. This article shows how standard sFlow instrumentation built into Mininet can be combined with sFlow-RT analytics software to provide real-time traffic visibility for Mininet networks. Augmenting Mininet with sFlow telemetry realistically emulates the instrumentation built into most vendor's switch hardware, provides visibility into Mininet experiments, and opens up new areas of research (e.g. SDN and large flows). OpenDaylight Project Proposal "Dynamic Flow Management"
In order to make it easier to get started, the latest release of sFlow-RT includes a Mininet helper script sflow.py that automates sFlow configuration. The following example shows how to use the script and build a simple application in Python. The sflow.py script extends Mininet, automatically enabling sFlow on each of the switches in the topology, and posting a JSON representation of the Mininet topology using sFlow-RT's REST API. 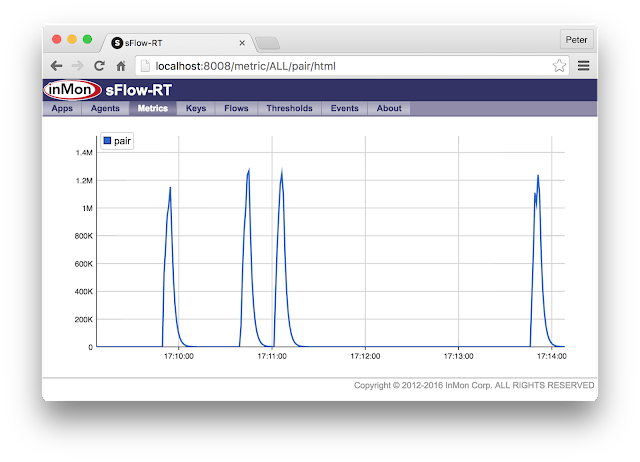 The script defines an Elephant flow as a flow that consumes 10% of the link bandwidth. In this example Mininet was configured with a link bandwidth of 10Mbit/s so an Elephant is a flow that exceeds 1Mbit/s. Since the specified flow measures traffic in bytes/second the threshold needs to be converted by bytes/second (dividing by 8). The sFlow-RT REST API uses long-polling as a method of asynchronously pushing events to the client. The events HTTP request blocks until there are new events or a timeout occurs. The client immediately reconnects after receiving a response to wait for further events. See Writing Applications for additional information. The output identifies the links carrying the flow between h1 and h3 and shows the IP addresses of the hosts. The sFlow-RT web interface provides basic charting capabilities. The chart above shows a sequence of iperf tests. The Python script can easily be modified to address a number of interesting use cases. Instead of simply printing events, a REST call can be made to an OpenFlow controller (POX, OpenDaylight, Floodlight, ONOS, etc) to apply controls to mark, mirror, load balance, rate limit, or block flows. Please Help me, i face this error " Caught exception.Cleaning up.... SyntaxError: invalid syntax (sflow.py, line 25) , when i run "sudo mn --custom extras/sflow.py --link tc,bw=10 --topo tree,depth=2,fanout=2" . I just tried it with sFlow-RT version 2.0-r1121 on an Ubuntu 14.04 system running Mininet 2.1.0 and Python 2.7.6 without any error. What is your setup? How does I make REST calls to POX for adding a flow?? POX is written in Python, so you should be able to modify the example to run as a POX application and access native POX APIs. Where i can find the sflow.py? It's in the sflow-rt extras directory. Which version of sFlow-RT are you using? The script is in http://www.inmon.com/products/sFlow-RT/sflow-rt.tar.gz, not the DEB or RPM distributions. how to use sflow with pox controller for load balancing? Hi Peter, how do I get the switch dpid from the inputifindex ? How can i check the flow table entries of Mininet ovs using sflow-rt? sFlow-RT cannot report the flow table entries. You can use the "ovs-ofctl dump-flows" command to get the active flows. Hi Peter, How to get all metrics of one switch ? The nodes section in the topology lists the Mininet switches and their ports. Each port has an ifIndex and you can use the ifIndex numbers to identify switch specific metrics, e.g. 1.ifinoctets is a counter associated with ifIndex=1. I was working on routing the flows after detection. Can you suggest me any tutorial? I am struggling finding one. I wrote an algorithm and need to implement it now. Thanks in advance. What are you using as your controller? How you re-route depends on the available APIs. I am planning to use POX or RYU controller. So do you mean there are API's which are already built for re-route? I am planning to use RYU or POX controller. So do you mean there are already API's for the controllers which can help me to re-route the flows? I don't believe RYU or POX has a REST API for programming flows. ONOS measurement based control describes how to use the ONOS controller. You could write your own Python extension to RYU or POX and access sFlow-RT's REST API to retrieve flow metrics, see Writing Applications for information on sFlow-RT REST APIs. When I change the fanout value to more than 2 then elephant.py does not detect or print any output. Is it because the script is unable to read the topology? I just tested the script and it appears to work. Are you using the latest version of sFlow-RT? You might want to load the Mininet Dashboard application. It can now display topology as well, see Mininet weathermap. Ryu measurement based control provides an example of using sFlow-RT with Ryu and Mininet. how we can use use dataset in mininet and miniedit environment kindly guide me as possible?? You need to install the requests module. I have tried requests module v. 2.2.1 and 2.22.1 with no luck.